The 5th and 6th grade BAND and 6th Grade CHOIR will have their Holiday Program on Thursday, December 14th at 7PM in the High School auditorium. Dress rehearsal will be on December 13th. Transportation will be provided by the school district. Be sure and check out additional Holiday Program information found under the 5th and 6th grade Performance Band tab. This is a picture of students in the 3rd grade assessing their progress on the recorder. Students write their first name only on the front of the sticky note. On the back students can respond with a check mark, minus sign or an X. Assessments are recorded by the teacher so that both students and teacher can track content understanding. It is a fun, colorful and fast way to get the job done! Check mark = I understand, Minus sign = working on it, almost have it, X = still not sure, need more help. 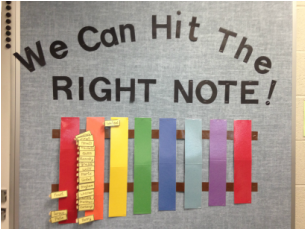 At Clarion Area Elementary, we can ALL hit the right note! Each week, classes have the opportunity to move up our "Incentive Xylophone"! Once a class makes it to the last xylophone bar, they will enjoy a "music" game day in which students will be allowed to choose from any of our extra music activities/centers for that class period.